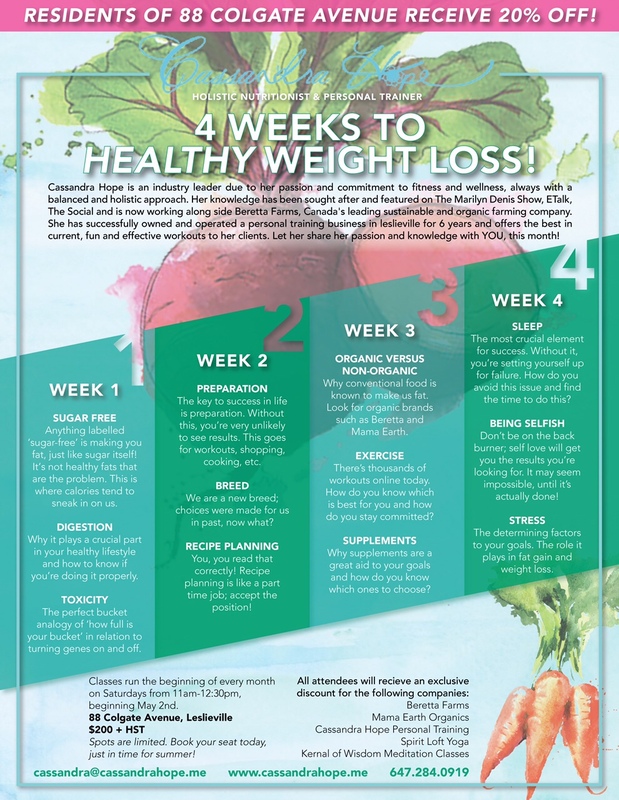 4 Weeks to Healthy Weight Loss! Join Cassandra Hope this May, for a 4-part nutrition workshop designed to leave you in-the-know about all things Nutrition, Exercise, Supplementation and De-stressing to help you Lose Weight the Healthy Way! No more guessing, walking through the grocery aisles aimlessly looking for “fat-free”, “sugar-free” products…no more scrambling to get organized or relying on store clerks to “educate” you about what supplements you should or shouldn’t be taking. What: A 4-Part Workshop on achieving weight-loss, the healthy way! How:Email Cassandra directly for more info or to book your spot today! We can think of no better topic to tackle from our holistic vantage point than stress. Nobody is immune to the experience of stress and whether we consider it harmful or not it is still a part of our everyday reality. Our intent is to provide you with the choices, tools, support and knowledge to cope with and thrive within the inevitability of stress. Come join us! Click here for the schedule, speakers, exhibitors & menu. Are you interested in deepening your knowledge of holistic nutrition? Then join us at our annual Canadian Holistic Nutrition Conference held at the Ontario Science Centre in May. This two-day event, running successfully for the past seven years, is the most comprehensive and current educational event in the industry in Canada! Our speakers present a comprehensive, well-rounded mix of hands-on techniques and viewpoints centered on nutrition. Enjoy the trade show, food demonstrations, dynamic speakers, and delicious organic food. Come to learn and network with other passionate and dedicated holistic health and wellness practitioners. We hope to see you there! WANT TO KNOW IF YOU SHOULD CUT BACK ON CAFFEINE? WHAT ABOUT REDUCING YOUR RISK FOR HEART DISEASE, DIABETES, OR HIGH BLOOD PRESSURE? Learn how your genes influence your nutritional success & health. Your genes not only determine things like your eye and hair colour, but they also determine how you metabolize and use the nutrients in the foods you eat! The problem with a lot of nutritional advice is that it treats everyone the same. What if there was a way to find out how your unique genetic make-up affected your response to certain foods, beverages and nutrients, and what the impact on the risk of nutrition-related chronic disease & how they influence athletic performance is? Would you want to know? Nutrigenomix™ is the first ever genetic test for personalized nutrition offered exclusively through Registered Dietitians. It’s an amazing innovation. With a simple saliva test, you can see how your genes influence your response to caffeine, omega 3 fats, sodium, whole grains/glycemic load, saturated fat, vitamin C and folate, as well as determine your risk for gluten intolerance. Dwell Gym will be hosting several Nutrigenomix ‘clinics’ towards the end of October with Doug Cook RD. Clients can sign up for a 15 minute visit which includes a pre-test consultation [what, when, how and to obtain signed consent] , collection of a saliva sample and payment [can be pre-paid online, credit card, cash or cheque]. Test results take 2 to 3 weeks. A follow-up consultation to explain test results can be done in-person, via phone, Skype or email. For more information, visit www.dougcookrd.com, to learn more about the tests. Details can be found under the ‘Shop’ tab. Tips to Keeping your 2016 Resolution! The Benefits of Balance Training! Please feel free to drop by during staffed hours. We never like to hear of businesses closing… but, we want to help you with your transition in finding a new gym. So, we are offering a special introductory offer for METHOD members. Email or call 416-465-6200 to find out what we can do… and how we can help.